Can someone kindly tell me what kind of slate this is and what the condition of it appears to be? I've included 3 pics. You're right it's Vermont green/sea green and yes, it's looks to be in VERY good shape. Nice slate roof. What are the "hips", if I can ask? The best picture to veiw and understand what hips are is the third picture. You see the long angled portion of roof that is a hip, on the left side of photo. All your photos have shots of hips in them. Now that I know what we're talking about, how bad are these and what's needed to remedy? Not too awefully bad shape but, does need some work. First you need to have the metal or underlayment under the slate hips inspected. I see that there is tar on the hip slates which leads me to think that there was a leaking problem, at some point. If the metal or underlayment is in good shape you need to re-seal hips (i'd suggest using a NP1 caulking). Some nails are missing and should be installed. on another note in your second listed photo I notice a diverter made of copper that has nails showing and it looks like when they installed the copper diverter they broke the slate below it when they installed a nail through it. Also that dosen't (to me) look like the best job, at all. Oh yea if you want to go the expense you can have copper installed on the hips, if neatly and professionally done would look real nice. I prefer the slate hip look. We redo alot of these usually we remove hip slate install copper or TCS in a step flashing form under the hip slate then reinstall hip slate, just like it was originally done and designed. I don't care for the tar or caulk look on the slate UGLY. But, it is a whole lot cheaper. GOOD LUCK oh one more thing get a true slate roof professional who does slate work every day for a living, it will save you alot of grief. 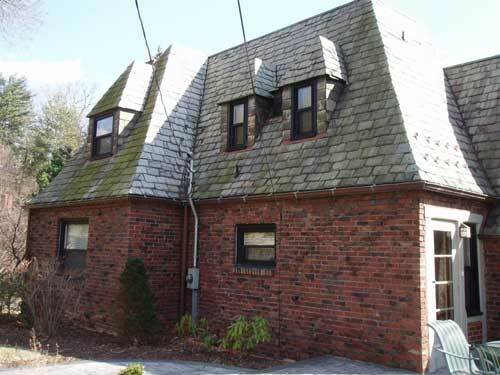 You have a beautiful slate roof and with alittle work it will outlast any other type of roofing twice fold. Here's another photo that I found on my drive of the roof. Thanks again everyone for the assistance! The hips may have some issues,but the closed valleys are probably about to start causing problems for you. The bulk of the field slates look fine,but the first place to look for potential trouble is where the water runs faster and stronger,i.e. valleys. I don't know if you're in a snowy climate,but if so the guttering is higher than it should be if snow should cascade off the roof. Beautiful house, beautiful roof. Take care of it. Walter Musson: Thanks for the info. I called a local slate roofer today to have him take a closer look at the roof. We're going to meet on Friday and I'll have him give me a prioritized list of what needs done now and what can wait a bit. Jim K: Thank you very much. It is a very nice house and we're moving along with the purchase of it. I love the steep pitched roof that this house has - it's by far the steepest of any we've looked at (a slate roof was a must have when we were house shopping - I wouldn't look at a house unless it had slate - drove my realtor nuts). Hi,Just wondering what area of the country that the house is located? I don't have measurements of the roof available (well, not the vertical sections of the roof anyway) but from looking at the photos, could someone estimate what it might cost to _properly_ redo the hip in question? If possible, what might I expect to pay to have the valley _properly_ redone? Ball park figures would be fine. It would be helpful to know the general location for advice on pricing-it varies quite a bit from region to region. The house is located in the Western PA area. Just wondering if my email had gone through - I sent it to both addresses that you provided.